A break during a white-water rafting trip in Bali. Check out the guidebooks below for more information about these activities. There are many professional guides available in the most popular tourist destinations. 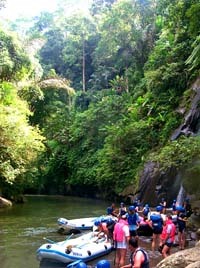 Indonesia is one of the premier destinations for outdoor enthusiasts of all types. Here are some guides for those looking for things to do on the water and under it as well as on dry land.